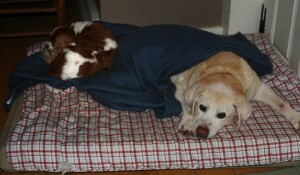 Dear sweet Ginger: 13 years of Labrador retriever love still going strong. Her body isn’t as agile as it was when she was younger, but she gives it her all and manages quite well. 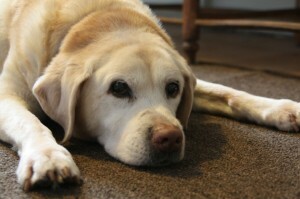 Regular acupuncture treatments ease the stiffness of her arthritis. The snow last week was no help, making getting around outside more difficult for her. Yesterday’s melt-down was welcome. But now the dark, dreary sky is spitting snow once again. Two weeks with Ginger has been a delight, and she will be going home soon. The other dogs have been very respectful of her. Do they know they should be considerate of their elders? Breathe deep, the gathering gloom….weather, that is. When it’s this dark all day, the dogs begin lining up for dinner around 3 pm wearing their best begging faces. Every time I pass through the kitchen, they pointedly check their watches and stare longingly in the direction of the bowls on the counter. If they could tap their feet, or drum their fingers, they probably would. No, say I to them, it’s not time yet. But they insist on staying put and waiting. It’s hard not to acknowledge why they might be fooled about the time of day. Hibernating – such a clever and expedient way to spend the winter. For now, I’ll just count the days until Solstice when I can tell myself there’s some immediately tangible corner we turn on that day. In truth, winter has barely begun. So breathe deep….